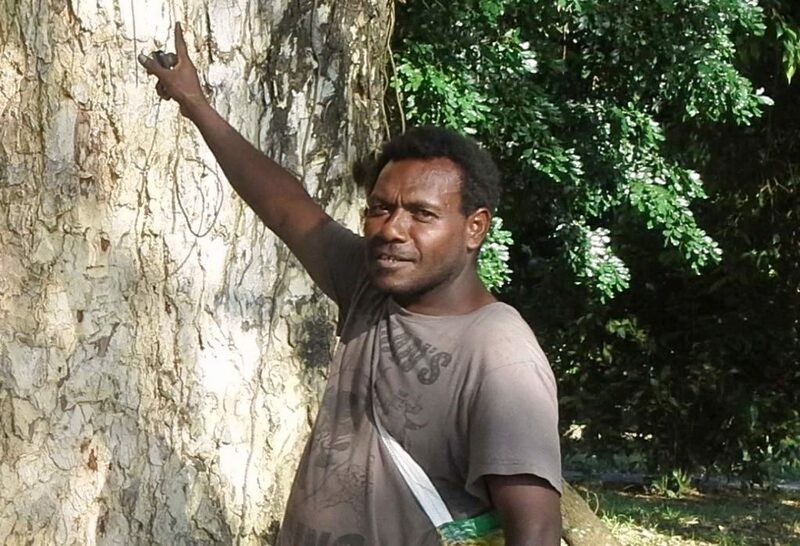 This testimonial was originally published in the recently released report of Oakland Institute, Taking On the Logging Pirates: Land Defenders in Papua New Guinea Speak Out! East New Britain Province is the location of eleven SABLs totaling almost 350,000 hectares, or about 20% of the province’s area. 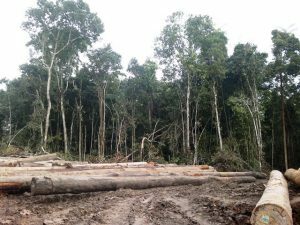 Several of these SABLs are controlled by subsidiaries of Rimbunan Hijau, a Malaysian group, which is the largest logging firm in the country. Three of these subsidiaries are operating in West Pomio. Gilford Ltd., controlled by Prime Resources Corporation Ltd., which is registered in Malaysia and obtained the SABL lease for logging and the establishment of a palm oil operation on about 40,000 hectares; Sinar Tiasa Ltd., controlled jointly by Gilford Ltd. and Monarch Investments Ltd. (a subsidiary of Monarch Logging Pte Ltd, which is registered in Singapore); and Niugini Lumber Merchant Ltd., a subsidiary of Wilmington Co. Ltd. registered in British Virgin Islands. These companies operate with two Incorporated Land Groups (ILGs), Pomata Investment Ltd. and Ralopal Investment Ltd. Paul Palosualrea is a resident of West Pomio who has dedicated his life to mobilizing and fighting against the theft of his land and the fraudulent practices of the logging firms. I share here how our land was signed away for 99 years without the consent of the true landowners. The district of Pomio has five Local Level Government (LLG) areas, and is approximately 12,000 to 13,000 sq km. It holds some of the most beautiful, virgin tropical rainforests, some of the deepest, most beautiful caves, clear running rivers, white and black sandy beaches, underwater coral reefs, and creation of all kinds that need protection on land and in the sea. 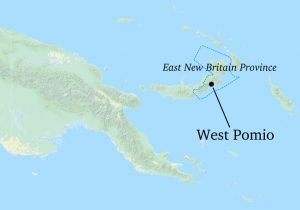 This story is about me and my people, the Mengen tribe of the West Pomio. The traditions, culture, and customs of the Mengen tribe are very unique and rich. They’ve always promoted peace and unity in the communities of West Pomio. Today, these practices are disappearing. Forests and lands are the wealth and foundation of traditional culture and customary practices, meaning we must have land and forest in order to practice our culture, a God-given birthright. The forests and the lands are God-given rights too. Land is our life. Land is our future generations’ life. These lands provide our “wholesale,” “retail,” and “bulk” stores. God provides all of our “hardware” goods for free to sustain our living. We use hard work as our currency to buy what we want and need and preserve the rest for our future generations. Two Incorporated Land Groups (ILGs) in the center of Pomio, Pomata Investment and Ralopal Limited, hold Special Agricultural Business Leases (SABLs) on our land. Pomata Investment claims to be the owner of my people’s land. They harvest vast timber resources in West Pomio. After Pomata came Ralopal Limited to also harvest the timber in the western side of West Pomio. At the same time, the people of Mauna, Lau, Bairaman Mu, and Puapal had their eco sawmill projects operating. The sawmills were producing and selling timber locally and internationally, including to New Zealand and Australia. The communities involved in this endeavor used land use maps to help them look after and manage their land and their forest with high governing standards. They eventually partnered with the Papua New Guinea Forest Authority, the Island’s Regional Eco Program (IREP), and the European Union’s Eco Forestry Program. The sawmill communities now continue to work with Forcert. In 2007, all of West Pomio was moved again. Pomata Investment and Ralopal Ltd. engaged with Memalo Holdings Ltd., an umbrella company headed by John Parulria, who does not own land in West Pomio. The plan was to control the LLGs [Local Level Government] of Melkoi, West Pomio Mamusi, and Central Inland Pomio. This plan was not made known to the people in all of those LLGs. Truly, only a few people supported the plan because they were misinformed. A majority of the true landowners stood up against the logging plan. There was much confrontation and arguing. The true landowners had their own small-scale sawmill logging initiatives in place. 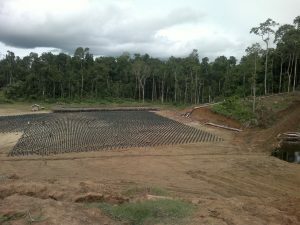 We objected by writing a letter in November 2007 to the Papua New Guinea Forestry Authority and the LLGs. We did not receive a reply from anyone. In 2008, signing took place at the district headquarters of Pomio, Palmalmal. No one thought to check whether the landowners truly gave their consent and that every document was filled out honestly. As a result, the Pomio SABL case became the most controversial deal in the country. The people of West Pomio—my people—didn’t even have the chance to know what was signed. There was no awareness, consultation, or negotiation. The delegation arrived at Palmalmal, and that very day began their business. After signing, they got on the plane back to Kokopo [the Provincial Capital]. I was present with a lot of other concerned landowners. No one was given a chance to have his or her voice heard. The delegation did not care about us, the landowners. We were treated like animals and second-class citizens on our own land. After signing, all the documents were kept a secret. It took us three years to find them. 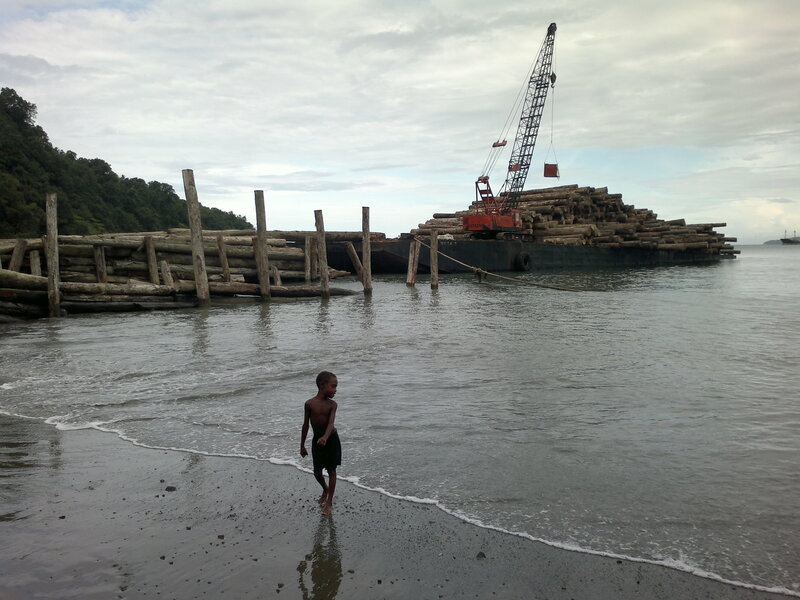 The Land Division of East New Britain Province did not help us. We, the true landowners, wanted to know what exactly was included in the land deal. In November 2010, Gilford Ltd. landed its machines at the old run down Drina plantation. My people and I started to mobilize and protested to stop the ship from landing its machines. We even went to the Pomio District Administrator, but he failed us. It was like David fighting against Goliath, except that Goliath won. The people in my village had to do something. I managed to travel to Port Moresby to meet with a CELCOR lawyer because our attempts as villagers and true landowners had failed. In March 2011, we went to CELCOR again. We filed our case at the National Court in Waigani while anti-land grabbing campaigns in Port Moresby reached a high point. Land grabs, the SABL, and the lease-lease back programs became the leading national issue. That was the first time my people and I learned about SABLs and the lease-lease back program. I also started to learn then about the legal requirements of the program—I could confirm that everything was not done right. The court ordered all of the documents of the land deal to be made available to all parties. They were released, but the Supreme Court dismissed our case on technical grounds stating that we did not file our case within the required period. We tried to explain through our lawyer that we village people knew nothing about the court system and that it took us nearly four years just to search for the documents. After we got access to the documents, we discovered many of the flaws and irregularities of the land deal. First of all, it was signed by five people from Pomata and Ralopal, not the true landowners. Besides, several official documents, including the Land Investigation Report (LIR) contained false information and fraudulent names and signatures. Some were of unknown people, and others of individuals falsely represented, such as children, and infants who were not even born at the time the LIR was produced. According to the law, the investigation should have involved all clan members in all villages involved, as well as a survey to determine land boundaries but none of this happened. Someone had simply done a “cut and paste” job of their signatures. During the trial, we the landowners continued to set up road blockades and invited international organizations to help us get support for our cause, but we are still waiting for justice. We have told the truth, but no one believes in us. We face a lot of hardship. Police have confronted our families and clan members, intimidating us and suppressing our rights. Some of our community members faced police brutality. They used abusive language, belted us with sticks, made us stand under the hot sun for hours, and arrested us. But no one has cared for us. Our rights as original landowners have been totally denied and abused. We managed to file land court proceedings to conduct mediation, but the local, district, and provincial land courts dismissed our attempts. The question of how our land was signed away was never considered. We have collected all the fraudulent information and evidence, which we will present before the court. Our second trial attempt does not have the support from the member of Parliament from Pomio nor the LLG presidents because they too are beneficiaries of this land grab. Our sacred sites, our land, our forest, and our environment will be totally destroyed by permanent environmental damage. Our children will not be able to enjoy what we enjoyed in the past. They will never be able to walk the forest, learn from it, and see for themselves the unique creation of God. This is very sad.